what you need – is to be better. Better than what your employees expect. Better than what your customers expect. Better than what your competitors expect. 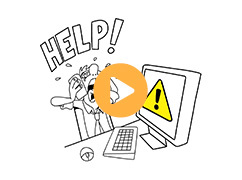 If you’ve started to question whether you can be as great as you need to be when it comes to building and maintaining an IT infrastructure, you’re not alone. Many businesses, from SMBs to major enterprises, have begun to realize that if they want to be next level in what they do, they need to be next level in IT. That’s why XBASE calls our Services “Exponentially Better™”. We’re not content to just quietly do what you (or a previous provider) have always done. Instead, we want to help you take that giant leap into the next phase of your organization’s evolution. We want to provide you with solutions, support, security and ideas that are so vastly superior to what you’ve been experiencing that you can’t help but be inspired to greatness. We achieve that by structuring and delivering our services in such a way that you are always receiving benefits at a multiple: twice as much live local support; triple the number of secure data centres over our local competition; our 31 years of experience in the Toronto market; and how you can have 100% guaranteed confidence in our data compliance measures. Whether you’re in Toronto or the various surrounding regions, including Durham Region, York Region, Halton Region, or Peel Region, learn more about XBASE’s IT Services below or call us at 647-560-1644. XBASE called to let me know that [our plant] had just dropped off from all the monitoring. This was within minutes of the accident. THAT is service! 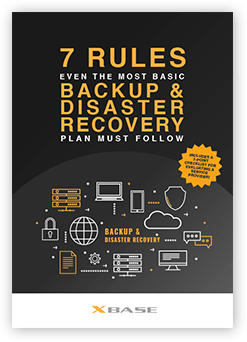 7 Rules Even the Most Basic Backup & Disaster Recovery Plan MUST Follow is a simple, informative guide for business owners who want to mitigate the impact of cyberattacks, technical failures, and natural disasters.